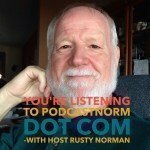 PodCastNorm dot Com – Page 3 – Podcasts, Interviews, Podcasting-Recording-Editing Resources and Much Much More! Podcasts, Interviews, Podcasting-Recording-Editing Resources and Much Much More! This episode is the latest from NascarFansView.com and JustAFansView.com and is a production of PodCastNorm dot Com with host Rusty Norman. It gives Rusty’s opinion of the 2018 Monster Energy NASCAR Cup Series races throughout the 2018 Season. As with any Monster Energy NASCAR Cup Series Season, there are always plenty of surprises from beginning to end and there is plenty of intensity and drama expected this year also. These article/podcasts are usually once weekly podcasts and sometimes even more when events warrant it during the NASCAR season (which generally runs from February through the middle of November.) Rusty is a former hometown Stock Car driver and owner and his passion and love for the sport is evident as he shares his take and opinion of the NASCAR Sprint Cup Series as the Season progresses from the season beginning at Daytona in February and ending with the Championship at Homestead, FL in November.